Preheat your oven to gas mark 5, 190°C or for a fan oven 170°C. In a small non-stick saucepan, melt the butter and sugar together. Add the condensed milk and bring to a gentle boil, stirring continuously until thickened and butterscotch in colour. This will take about five minutes. Do not overcook as the butterscotch will become too firm. Pour the butterscotch into ready-made pastry cases and place in the oven for five minutes. Remove the tarts from the oven and place on a wire rack to cool completely. 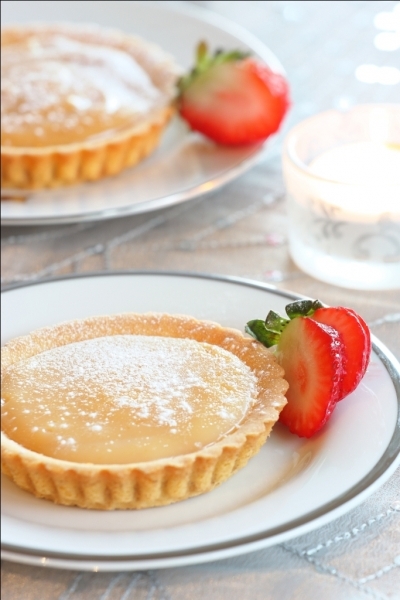 To serve, decorate with sliced strawberries and dust with a little sieved icing sugar. Any leftover butterscotch can be warmed gently and served with ice cream. To add fruit when fresh strawberries are out of season, add canned strawberries or raspberries.